Q: Today, President Trump wrapped up his visit to China. His visit has attracted considerable attention from people of various sectors from both home and abroad. What is your comment on this visit? A: At the invitation of President Xi Jinping, President Donald Trump paid a state visit to China from November 8 to 10. This is the first state visit received by China following the successful conclusion of the 19th National Congress of the Communist Party of China (CPC) and it has drawn great attention not only from China and the United States but also from other countries around the globe. Thanks to the concerted efforts of the two sides, it has become a successful historic visit. During the visit, President Xi Jinping and President Trump had a candid and in-depth exchange of views on China-US relations and major international and regional issues of common interest and reached a series of new important consensus on the growth of China-US relations in the next period to come. The meeting of the two heads of state in Beijing has achieved important and fruitful outcomes. Firstly, the two sides reaffirmed the importance of China-US ties and expected to develop the more sustained and robust China-US relations. They believe that China and the United States have extensive shared interests and responsibilities in upholding world peace, stability and prosperity and in which direction the China-US relations will head can have an important influence on the whole world. The China-US ties that enjoy constant growth not only serve the fundamental interests of the two peoples but also meet the shared expectations of the international community. The development of China and the United States is mutually reinforcing and can be achieved in parallel. The success of either side serves the common interests of the two countries. They should respect each other's sovereignty, territorial integrity, respective choice for development path and the differences between them. As for China and the United States, cooperation is the only right choice and pursuing win-win outcomes can lead to a better future. The two sides have agreed to continue giving play to the strategic guiding role of the head of state diplomacy in bilateral relations, step up high-level exchanges and exchanges at other levels, bring into full play the role of the four high-level dialogue mechanisms, expand cooperation between the two militaries and in such areas as trade, law-enforcement and people-to-people interactions on the basis of mutual benefit, properly manage differences on the basis of mutual respect, enhance the mutual understanding and friendship between the two peoples and strengthen communication and coordination on major international and regional issues so as to move forward the China-US ties. Secondly, the two sides have reached important consensus on handling the issue of economic relations and trade in a constructive way with important outcomes being achieved in this regard. They are willing to stay committed to the China-US economic cooperation and trade featuring mutual benefit and win-win outcomes and have agreed to tackle the problems and contradictions arising from the rapid development of China-US economic relations in a forward-looking and constructive manner, resolve them by making the pie of China-US economic cooperation bigger and promote the sound and steady growth of China-US economic relations and trade in a dynamically balanced way. The business contracts and two-way investment agreements inked by the two countries this time are valued at over 250 billion US dollars, which demonstrates that the China-US economic cooperation and trade is broadly based and enjoys a bright prospect. Thirdly, the two sides have reached important consensus on properly addressing the Korean Peninsula nuclear issue. They reaffirm their strong commitment to realizing the denuclearization of the Peninsula, upholding the international non-proliferation regime and resolving the issue through dialogue and negotiation. They stand ready to jointly explore a way to achieve the lasting peace and stability of the Peninsula and Northeast Asia with other relevant parties. The China-US ties are now standing at a new historical starting point. The meeting between the two heads of state in Beijing charters the course and maps up the blueprint for the growth of China-US relations in the next period to come. The Chinese side stands ready to join hands with the United States to earnestly follow through on the important consensus reached by the two heads of state, focus on cooperation and manage differences in the spirit of mutual respect and mutual benefit so as to promote the sustained, sound and steady growth of China-US relations in the new era. Q: Firstly, it is reported that President Xi Jinping has just arrived in Da Nang, Vietnam and he will attend the 25th APEC Economic Leaders' Meeting. Has the schedule of President Xi been finalized and can you release it? Which economies' leaders will President Xi meet with? Secondly, regarding the trade imbalance between China and the United States, the US President Donald Trump yesterday said that he will not blame China and it is the fault of the past several US administrations. What is your view on this? A: On your first question, President Xi Jinping has arrived in Da Nang, Vietnam this afternoon. He will attend the plenary session of the Dialogue between Asia-Pacific Economic Cooperation (APEC) Leaders and APEC Business Advisory Council (ABAC) Representatives, the parallel session of the Dialogue between APEC Leaders and ABAC Representatives and the Informal Dialogue between APEC and ASEAN Leaders this afternoon. Tomorrow he will attend the APEC Economic Leaders' Meeting. During his stay in Da Nang, President Xi will hold bilateral meetings with Russian President Vladimir Putin and other leaders. We will release the relevant information in a timely manner. On your second question, China and the United States are the top two largest economies in the world with highly complementary economic relations and structures and deeply integrated interests. With the rapid growth of China-US economic cooperation and trade, it is quite natural for the two countries to have some differences and frictions. Resolving relevant issues calls for the concerted and unremitting efforts of the two sides. I have said just now that during President Trump's visit to China this time, important outcomes have been reaped in bilateral economic cooperation and trade, which speaks for the broad prospects and vast potential of this kind of cooperation and trade. The Chinese side stands ready to join hands with the United States to follow the principle of equality, mutual benefit, mutual understanding and mutual accommodation to properly address relevant issues through dialogue and consultation in a forward-looking and constructive way and by making the pie of China-US economic cooperation bigger and bigger, so that the China-US economic relations and trade can move forward in the direction of dynamic balance, mutual benefit and win-win outcomes. Q: Panamanian President Juan Carlos Varela will pay a visit to China next week. Could you give us more details on this? When will he meet with President Xi Jinping? A: At the invitation of President Xi Jinping, President Juan Carlos Varela of the Republic of Panama will pay a state visit to China from November 16 to 22. During his visit, President Xi Jinping will hold a welcoming ceremony and banquet for him, and the two heads of state will hold talks and jointly attend the signing ceremony of cooperation documents. Premier Li Keqiang and Chairperson of the CPC Central Committee Zhang Dejiang will meet with President Juan Carlos Varela respectively. In addition to Beijing, President Juan Carlos Varela will also travel to Shanghai. China and Panama established formal diplomatic ties this June. During the past five months and more, the relations between the two countries have got off to a quick start and enjoyed rapid development. While visiting Panama in the middle of this September, Foreign Minister Wang Yi said that China and Panama had waited for too long for the establishment of diplomatic relations, and we should lose no time in developing our comprehensive cooperation. Since the establishment of diplomatic ties, we have set up embassies and our departments have quickly worked with their counterparts. We have launched in synchronization over ten cooperation agreements in such fields as trade, investment, quality inspection, shipping, civil aviation, finance, tourism, culture and judiciary. The two countries boast great vitality of development and have enormous complementary advantages, so we can surely speed up the development of our cooperation. The Chinese side highly values its relationship with Panama. Taking the opportunity of President Juan Carlos Varela's visit, we stand ready to continuously enhance mutual understanding and mutual trust and accelerate friendly exchanges and mutually beneficial cooperation in various fields for our common development and to the benefits of the two peoples. We believe that President Juan Carlos Varela's state visit will open up a broader prospect for China-Panama relations and a new era of common prosperity for the two countries. Q: Recently, Typhoon "Damrey" batters Vietnam. Has the Chinese side sent a message of condolence to Vietnam? Will China provide assistance to the Vietnamese side? A: Recently, the central and southern regions of Vietnam were hit by a strong typhoon. General Secretary and President Xi Jinping has sent a message of condolence to General Secretary of the Communist Party of Vietnam (CPV) Nguyen Phu Trong and President of Vietnam Tran Dai Quang, which expressed deep sympathy and sincere condolences to the losses of life and property caused by the disaster. China and Vietnam are friendly neighbors. In order to help the Vietnamese government with its disaster-relief efforts, the Chinese government has launched the foreign emergency humanitarian assistance mechanism and will provide the needed supplies to Vietnam as soon as possible. We are convinced that under the strong leadership of the Vietnamese Party and government, the Vietnamese people are bound to overcome the disaster and rebuild their homeland at an early date. Q: We are wondering if there is any information from the Chinese side about new developments in regulating the opioid substances, fentanyl in particular following President Trump's visit? 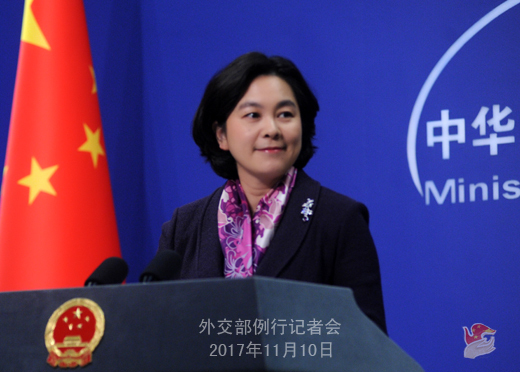 A: Yesterday, Vice Minister Zheng Zeguang gave the media an introduction on the relevant information and outcomes of President Trump's visit. The two sides have agreed to continue enhancing their cooperation in the field of regulating new psychoactive substances and their precursors and anti-drug law enforcement and engage in bilateral anti-drug intelligence exchanges. The Chinese side will continue promoting the listing and regulation of the new psychoactive substances which are highly concerned by the two sides. The two sides will strengthen intelligence-sharing on fentanyl analogues, conduct cooperation on individual cases which involve drug-related postal parcels and jointly combat illegal trafficking activities. I would refer you to the Ministry of Public Security for detailed information. 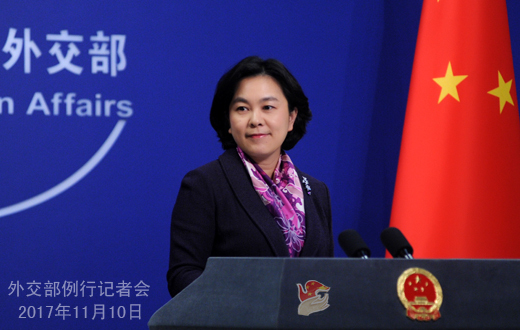 Q: Firstly, there are reports that Special Representative Talks on China-India Boundary Question will be held. Can you tell us whether the time and schedule have been finalized? Secondly, the China-Russia-India Foreign Ministers' Meeting will be held next month. Do you know the detailed arrangements for this? A: With regard to your first question, the leaders of China and India attach great importance to the boundary question. For many years, the two sides have made tremendous efforts to settle the border issue. The Special Representatives on China-India Boundary Question have held nineteen rounds of talks, in which they had a full exchange of views and positive progress has been achieved. Currently, the mechanism of Special Representatives on China-India Boundary Question has been operated smoothly. The two sides will discuss and finalize the time of this year's talks in due course. If we have the relevant information, we will release it in a timely manner. With regard to your second question, the Chinese side highly values the China-Russia-India cooperation mechanism and supports the Indian side in holding the 15th China-Russia-India Foreign Ministers' Meeting. Now the three parties are maintaining communication on relevant detailed arrangements. 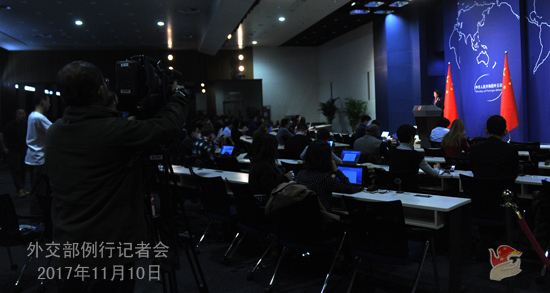 Q: The series of Leaders' Meetings on East Asia Cooperation will be held soon. Will Premier Li Keqiang meet with Indian Prime Minister Narendra Modi on the sidelines of these meetings? A: I have no information to offer to you.